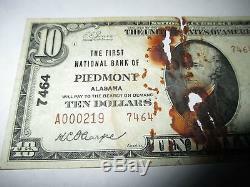 It is issued from The First National Bank Of Piedmont. This note is very rare, and it is getting much harder to find this type of bill! 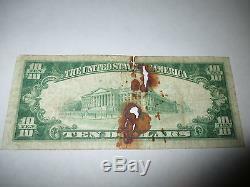 This note has a lot of crisp left to it but shows some obvious rust damage. The is still an extremely scarce town, that is priced to sell! This bill is a must have for any collector of National Currency! All my items are exactly as described. Also feel free to brows my store for an extensive collection of National Bank Notes from all over the country! Thanks for looking and good luck! 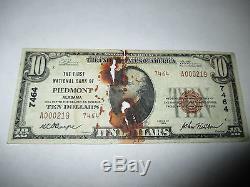 The item "$10 1929 Piedmont Alabama AL National Currency Bank Note Bill Ch. #3981 RARE" is in sale since Thursday, November 19, 2015. This item is in the category "Coins & Paper Money\Paper Money\ US\National Banknotes".